...Plastic waste takes anywhere between 500-1000 years to degrade. ...50% of the plastic we consume is single-use plastic. ...Only a very small percentage of the tons of plastic that is produced ever gets recycled; most of it ends up in our oceans. That plastic is detrimental to our planet and is already encroaching into our food chain is common knowledge. But have we done much to reduce our contribution to the trash? Despite more and more people becoming aware about the adversities of plastic pollution, so few actually do anything to reduce their plastic consumption. I think the war we are waging is against habit. That old darn habit. Walk into the supermarket, walk out with a can of soda...in a plastic bag... habit. That old darn habit. The other hurdle that companies like Avani (founded by an entrepreneur from Bali) are trying to cross is the cost factor. "The cost of biodegradable cutlery is about 30% higher and that is the single biggest challenge for operators in the hospitality industry. So outlets like Noodle House and Freedom Pizza, and delivery platforms like Zomato ask customers if they are comfortable with paying an extra charge for Avani's eco-friendly cutlery to be included with their takeaway order." shares Peter Avram, Director, Avani Middle East. On the question of how companies can run a profitable business whilst promoting the cause of environmental conservation, Avram says the absence of strict regulations from authorities is also currently a barrier. Avani offers eco-friendly alternatives such as paper straws, wooden cutlery, and more. Keep your eyes peeled open for soon they will be partnering with a giant retailer in Dubai to replace plastic bags with cassava bags. When it comes to shopping, I have been using cloth bags since years but never impressively consistent. It was when I took to cleaning out my kitchen one fine day that I realized and was grimly ashamed at the amount of plastic bags I had accumulated that I vowed to use cloth bags by default. Let me stress that again, by default. I would allow myself no excuses to resort to plastic bags. People talk about losing weight or eating healthy as their new year's resolution; mine at the start of 2018 was to ban plastic bags. And I'm proud to say, in four months, I have only ever brought home one plastic bag (and that's one too many I think). While I understand that plastic usage can seem unavoidable in our daily life and is at the core of the convenient lifestyle we demand, we need to treat the plastic problem with a sense of urgency. You may be aware of the Great Pacific Garbage Patch (read this). But watch this Vice video to learn how 18 year old inventor Boyan Slat is working to rid the oceans of micro-plastics with his venture The Ocean Cleanup. For those of us not capable of inventing The Ocean Cleanups of the world, we can fight everyday habits and make minor lifestyle shifts to reduce our plastic footprint. This Earth Day, let's fight the what-difference-will-it-make-anyway mindset. 1. Stop using plastic straws. Straws are the ideal example of a single-use plastic items that we use for a few seconds, but remember one straw can take over 500 years to degrade. Acknowledging this 'sucky' problem, McDonald's UK recently announced that by May, it will phase out plastic straws from its 1,300 stores. Biome has silicone, glass and steel straws which are reusable. Keep some home, carry some with you. 2. Carry a cloth bag with you at all times. I always keep one in my purse which comes in handy for those impulsive grocery shopping trips. According to ConservingNow, around one million plastic bags are used per minute. Shocking! The check-out aisles at supermarkets are a sight for sore eyes courtesy the sheer number of plastic bags. Anyone from Carrefour reading this? Please, please bother with a cloth bag. Also, hey Dubai, if Kenya can ban plastic bags, so can we! 3. Invest in a water bottle and again, carry it with you when you leave the house. This way, you avoid buying overpriced plastic water bottles that make companies like Nestle richer and contribute to plastic pollution. This Guardian article says humans produce a staggering 20,000 bottles a minute. Also, if only to avoid the calories, say no the next time you're offered a soft plastic drink bottle. 4. Opt for bamboo cotton buds. Photographer Justin Hofman captured this heartbreaking picture of a cute little seahorse in the ocean grasping a cotton bud. It is a sad retelling of how marine life is having to live with our waste. So this month, I chose to replace plastic cotton buds with 100% biodegradable bamboo cotton buds. If you are in Dubai, Miniso stocks them, else, order GoBamboo from Amazon. 5. Brush your teeth with non-plastic toothbrushes. Plastic Pollution Coalition estimates humans use an average of 300 toothbrushes in a lifetime. There are almost 7 billion of us on earth. Do the math. But there are biodegradable wooden and bamboo options. This toothbrush even uses natural bristles made of pig hair. Not kidding. Brush with Bamboo ships them worldwide. Souq and Alibaba also do. 6. Skip the plastic lids for your takeaway coffee. Made of polystyrene, the lids are toxic and carcinogenic. Most of them cannot be recycled and end up in the ocean. Think about the damage this single use plastic lid causes. Besides, your takeaway coffee cup is also lined with plastic making them non-biodegradable. Next time you order a java-to-go, think twice - I know I certainly will. 7. You really don't need that plastic cutlery. So many times when you order a takeaway, the guy behind the counter gives you not one but multiple plastic-wrapped plastic cutlery, and even a handful of tissue papers enough for a family of ten. Ultimately, even the untouched and unused ones are dumped into the bin. Such unnecessary waste. Did you know, plastic breaks down into micro-plastics which are then mistaken by marine life for food - thus endangering them. 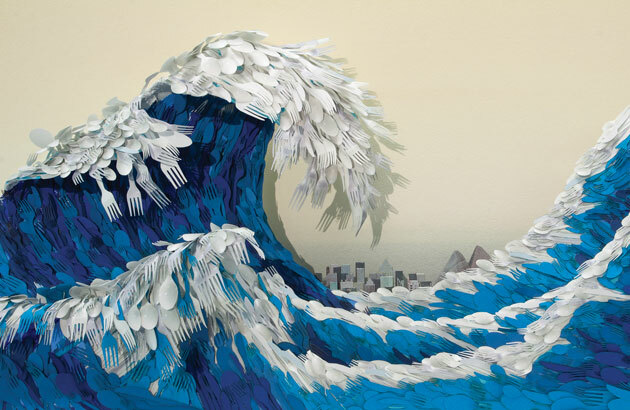 Big props to France that became the first country to ban plastic cutlery. One brave company in India has taken its fight against plastic cutlery to the next level - by creating not only biodegradable cutlery but nutritious, edible ones too! 8. Use eco-friendly razors to shave. Boys and girls, did you know that our grooming habit of shaving results in over 2 billion razors being tossed in a year? That convenient bathroom item actually is menacing to the planet. So here are some easy alternatives to plastic razors. 9. Line your bin with paper, not plastic. I got this tip from my sister, who has replaced plastic garbage bags and instead collects kitchen waste in discarded newspapers lining the bin. 10. Make your voice matter. Ladies, join me and 1 million women making lifestyle changes to reduce overall carbon waste. Subscribe to their newsletters which have some handy tips. Get involved in the End Plastic Pollution campaign. UAE residents, join the Sustainability Tribe's #ZeroWasteUAE initiative, as well as Avani Middle East's #IAmNotPlastic and #RefuseTheStraw campaigns. Leave a comment and tell me if you found these tips handy or if you have any handy tips to share.